This Sunday, Waves offer special discounts on their Maserati GRP, eMo Q4 Equalizer and Waves Tune plugins. This month, Eventide holds a special sale on its Precision Time Align plugin. 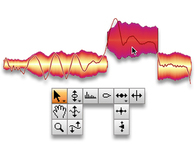 Today only, Antares Systems offers Auto-Tune 8 at the special price of $249. Today only, buying Waves' SoundShifter plugin for the special price of $49 allows you to get Morphoder for free. Synchro Arts have released version 3.2 of Revoice Pro, which is announced as a major (and free) update to their processing software. MeldaProduction now offers 50% off four (instead of three) plugins each week, and here are this week's opportunities. Today again, Waves offers two plugins and one bundle at reduced price. Already part of Eventide's Anthology X bundle, the Octavox harmonizer is now available on its own - and at a special launching price. A live demonstration from the NAMM of the new Melodyne 4 by Celemony. Celemony has released Version 4 of its audio software Melodyne, announced as the most extensive update ever to the entire Melodyne product family.